Fairbanks, like other great American cities, began with a spirit of discovery and adventure. Many of it’ first residents arrived in search of gold, and were surely enchanted by the natural beauty and spirit of the Alaskan frontier. These days, Fairbanks is known more for friendly people and its rich embodiment of Alaskan culture. It also happens to be the second largest city in the state. You could live an entire lifetime in Fairbanks and fall short of experiencing everything it has to offer. Still, most residents and past visitors would point out a few things that you just can’t miss. Nothing can make you feel more at home in a new city like a great tour. 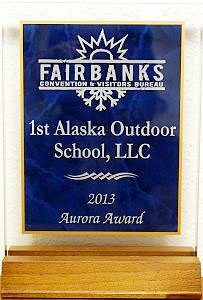 Here at 1st Alaska Outdoor School, we offer a variety of tours in and around Fairbanks, Alaska. Some last a few hours while others last a few days, but we pack every one with as many fascinating moments as possible. Don’t leave Fairbanks without experiencing it just like the locals do. It’s difficult to describe the amazing experience that Pioneer Park has to offer. Referred to as a “historic theme park”, Pioneer Park houses a multitude of museums, restaurants, and other attractions, all in the guise of a traditional Alaskan settlement. Included in our Fairbanks City Tour, Pioneer Park is the one Fairbanks spot you simply cannot miss. Experience the activity that Fairbanks was built on. There are plenty of great places to pan for gold in the area. It won’t make you rich, but it’s still very fun to experience the excitement that sparked Fairbank’s initial growth and helped it become the great city it is today. Visitors to Alaska often yearn for a time machine, something to take them back to experience the historic Alaskan culture firsthand. This museum is the closest thing to it. Constantly updated and expertly curated, the UA Museum of the North holds an outstanding collection of Alaskan art, including Native American artifacts, and interactive exhibits that are fun for the entire family. Whether you’re a motor-head or not, this charming museum is sure to catch your interest. Chock full of historic cars and authentic fashions of the past, the Fountainhead Antique Auto Museum takes visitors on a journey into the past through two elements of life that we’re all intimately familiar with: cars and clothes. For more information on everything Fairbanks has to offer, browse our website or give us a call to learn more about our great Fairbanks tours today. What’s going on in Fairbanks, Alaska this winter?